Sluglett, Peter and Currie, Andrew. First Edition. Oxon, UK: Routledge – Taylor & Francis Group, 2014. 112 p. $36.02. The Atlas of Islamic History by Peter Sluglett and Andrew Currie consists of 44 maps, each of with a significant essay (about 1,500-2,000 words) explaining each of the maps, chronologically ordered starting from circa 570 CE and all the way up to the twenty first century. The end papers also include hemispheric slice to include Africa, Europe and Asia, the first focusing on the spread of Islam and the last focusing on the Islamic world in the twenty first century. Each of the main maps in the atlas and its accompanying essay are of a certain period of time, geographic or thematic or a combination of the three. Following this a substantial chronology of Islamic and world history. I am particularly pleased with the accompanying essays. The maps themselves, appear to be accurate and represent the content in the text, but are extraordinarily busy and crowded with information. There is a complex dynamic interaction between the spread of Islam, states, dynasties, borders during certain periods in certain parts of the world, and the authors attempt to capture this in a large-scale map, which, even with a magnifying glass, is difficult to decipher. For example, take Map No.29, which focuses on South Asia, focusing on what is now India, Pakistan, Afghanistan and China. Red arrows denoting movement clash with a confusing diagonally striped area, with no explanation of the striped area in the legend or anywhere in any map in the entire atlas. Another particularly busy map is the Map 41, which focuses on the spread of Islam in Eastern Africa. Not only are the striped lines mystifying—name placement is competing with routes and different colored routes. Map 35, which is about the decline of the Mughal Empire between 1707 and 1820 is virtually a meaningless rainbow of diagonal stripes. In contrast, Map 36 which focuses on the revival and reform of Islam under the British rule between 1820 and 1910 is well done—here the authors strike a good balance between information and map readability. This is also true of some others, such as Map 5, which focuses on Islam and Christianity between the years 768 and 814. The cartographic director, Currie admits that this was his most challenging work to date—a challenge he clearly has not conquered. In contrast, the text, presumably written by Peter Sluglett is relatively simple to follow and well written. 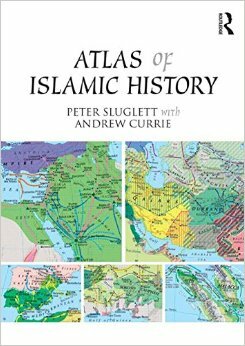 There is a paucity of atlases on Islamic History. For that reason and that reason alone, this atlas is an important piece of work which chronicles different themes and periods well. But the visualization of the maps would have been more effective if they were interactive on a website. There is a certain degree of stylization, generalization and artistic mastery that is missing which unfortunately will withdraw the reader from looking at many of these maps with the time it demands. The text is excellent but most of the maps are far too crowded with information and only simplifying the maps or layering those using software will make the visualization accessibly to the discerning reader.